Not all drones are wreaking havoc this Christmas. Vodafone has launched the UK's first drone delivery over a 4G mobile network. The drone, which was specially kitted out in Santa sleigh style, delivered a Christmas hamper to to Portland Bill Coastwatch. The coastal watch tower is located in one of the most southerly and remote parts of the UK and is manned by a team of 75 volunteers. Known as the ‘watch keepers’, these volunteers complete more than 9,500 hours of service each year and work closely with the emergency services to help save lives. Vodafone’s drone delivered them a hamper full of Christmas treats, including mince pies, chocolate and gingerbread men. The stunt marks the first time a drone delivery has been controlled using the 4G network in the UK; usually drones are controlled within a line of sight from the ground. Mischief played a large role in conceiving and executing the campaign. "Technology plays an increasingly important role in connecting people over Christmas. 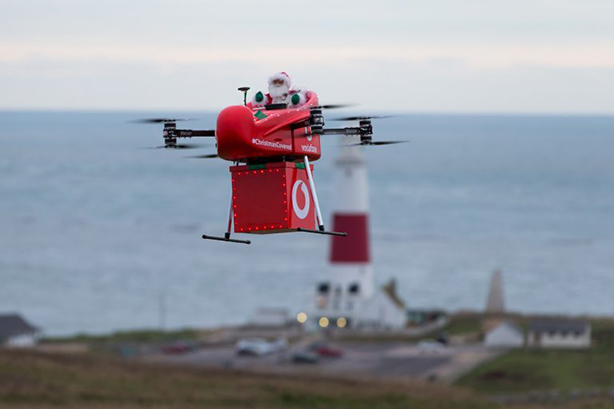 Flying a drone over 4G for the first time gives us a glimpse of what Christmas deliveries of the future might look like," Vodafone UK chief technology officer Scott Petty said. "We have been working hard to build a network that now covers 99% of the UK population, and I’m really pleased we’ve been able to use it to support our rural communities this festive season."